(TB1EWD0) Geopelli Geocoin - Todie's Wild Ride: Mountain Biking. Todie's Wild Ride: Mountain Biking. Use TB1EWD0 to reference this item. 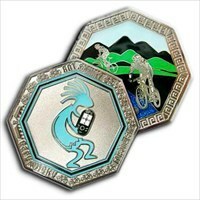 This coin has been released as part of the Bike Awareness Project. With that in mind run, fly, scoot, ride or just motor me to the next cache as fast as you can so I can get the word out. This Geopelli Geocoin is released to bring awareness to the dangers faced by pedal bikes and motorbikes alike on our roads today. It is a project initiated by Rockin Roddy in response to the death of his dear friend and caching companion Todie Phillips who was cut off by a left turning vehicle too much in a hurry to notice oncoming traffic. Tod was the 3rd member of Team Rod & Tod w/KAboom. PLEASE be aware of the pedal bikes and motorbikes that use the roads just as you do. Pay a little extra mind when you change lanes, pull out into traffic or change direction of travel by turning into other lanes of traffic or squeezing the bike lane to your right. That could be YOUR friend, family member or loved one there in your blind zone, your peripheral vision, or direct line of sight that you are about to collide with or cut off. Gallery Images related to Todie's Wild Ride: Mountain Biking.